Secrets from the Sleeping Bag by Rose Cooper. A Blogtastic! Novel. Review: Humor, romance, and more humor are all words to describe this book! Secrets from the Sleeping Bag by Rose Cooper is a novel you must read!! Sofia is NOT looking forward to going to summer camp. Little does she know the surprise that she's in for! Journey through all of Sofia's crazy adventures at Camp Krakatow and maybe have a laugh while you're at it, too! Sofia Becker is not happy about having to go to summer camp for four weeks. What makes it worse is that she has the meanest counselor and she has no friends in her cabin. She does like seeing the cute boys though and there is one she has a crush on. Luckily, she has her diary for writing all her adventures. Things at Camp Krakatow just aren't normal, especially for Sofia. Can she survive? Secrets from the Sleeping Bag made me laugh out loud! It was so fun to read about all of Sofia's adventures. This book is very well written and I loved it! It has extremely creative ideas and I think readers will be able to relate to some of their own summer camp experiences. 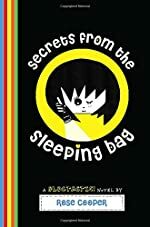 Secrets from the Sleeping Bag is appropriate for all audiences but I think it would grab the attention of kids between ages 8-12 most. I give Secrets from the Sleeping Bag five stars for its humor and creativity! You must read this book! You will love it! We would like to thank Random House for providing a copy of Secrets from the Sleeping Bag for this review. Have you read Secrets from the Sleeping Bag? How would you rate it?